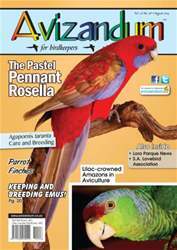 We hope you enjoy this issue of Avizandum. For those of you who subscribe online using our website, we now also accept American Express and Diners Club cards. Every springtime you’ll hear stories of how a female bird suddenly looks to be at death’s door, when the previous day she was happy, active, and building up a nest. More often than not, the cause of such sudden “illness” is not really a disease at all, but the result of her inability, for whatever reason, to lay her egg. This is most commonly known as egg binding, and it can be deadly.